A FILM premiere with a difference took place in Aldbourne recently. There was no red carpet or paparazzi, as the stars were already ensconced inside the venue, and designer ball gowns were conspicuous by their absence. But the champagne flowed as the stars of Skin Care for Older People received a preview screening at Aldbourne Nursing Home, where many of the scenes were filmed. The 30-minute film was created by Marlborough-based video production company Mole Productions on behalf of the UK’s number one nappy rash product; Sudocrem®. Although beloved of new parents, the product is also widely used by nursing homes and care agencies, where it is used for the effects of continence issues as well as surface wounds and minor burns. Anne Webb, manager of Sudocrem®’s Promotions and Training team, explained: “We have 16 Promotional Representatives across the UK. 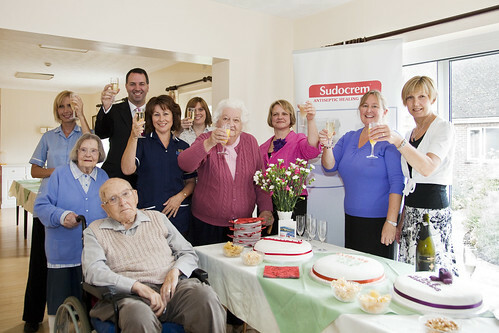 Our aim is to promote the good care of older skin and the use of Sudocrem in nursing and care homes. Wendy Sheen, who is Matron at Aldbourne Nursing Home and has 20 years’ experience in the care of elderly people, said even she learnt new things from watching the film. Among the preview audience were pensioners Joan Gellatly, Bill Eyre and Lilian Charman, who all enjoyed starring roles in the film.